When registering for PCF4, delegates can opt for an "Accommodation plus Registration" package or a "Registration Only" package (for which delegates make their own accommodation arrangments). "Option A - Accommodation plus Registration"
The Forum organisers hope that the majority of PCF4 delegates will choose to be accommodated in the Forum Hotel - the Sunset Jamaica Grande Resort - for which special rates have been negotiated that can only be obtained at the same time as registration for PCF4. Further details of the hotel can be found further down this page under "Additional details". To obtain the reduced rates quoted for this hotel, your booking must be made on the PCF4 Registration form and the Invoice paid as soon as possible. "Option B - Registration Only"
This option provides the delegate with PCF4 "early-bird" (until August 31, 2006) registration at US$550, but you make your own accommodation arrangements. Conference Passes (4 Convention Day Passes and 1 Evening Pass) required by the Sunset Jamaica Grande hotel for non-resident delegates to enter the PCF4 venue are included in the cost of registration. Being a popular tourist destination, there is a great deal of accommodation available at various prices in Ocho Rios (from US30.00 for a single room with all conveniences). Included below is a table showing a range of the hotels conveniently located for PCF4 delegates. Below the table, additional details of these hotels are given. The Sunset Jamaica Grande Resort is the venue for the Forum. Featuring 1,300 feet of sandy subtropical beach, Renaissance Jamaica Grande is the island's premier resort, offering guests a fantasy vacation with excellent cuisine and many activities including water-sports, golf, tennis, deep-sea fishing and more. Just a five-minute walk from historic Ocho Rios, Renaissance Jamaica Grande is a self-contained beachfront resort located along the breathtaking coastline of Jamaica near natural waterfalls and fern-covered cliffs. Non-motorized water sports and activities including aqua cycles, pedal boats, sea peepers, and kayaks. 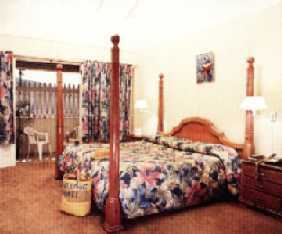 The 708 guestrooms were newly refurbished in 2005 with contemporary tropical décor. Balconies are furnished with chairs and cocktail tables. Other amenities include in-room safes, cable/satellite television, Internet access and compact refrigerators upon request. Please note: all rooms are non-smoking. Off-premises golf, horseback riding and river rafting. This location is about 10 minutes walk from the conference venue. The Village Hotel is most conveniently located across the road from the Forum venue. Situated in the heart of Ocho Rios, between the breeze caressed hillside of Ocho Rios and the blue Caribbean Sea, the hotel is within easy walking distance (3 min) from the beach (which has all water sports facilities), entertainment, shopping centers, banks, and post office. The hotel has a swimming pool; restaurant and bar; total body care center; and, 34 air-conditioned rooms, each with private bathroom, cable TV, telephone, safe deposit box, some with kitchenettes, and some with own private jacuzzi. The Crane Ridge Resort is a complex of nine three-story residences encircling a fresh water swimming pool with swim-up bar and whirlpool. It offers spacious one and two bedroom suites with large private balconies, perfect for breakfast and a view of the Caribbean Sea and Ocho Rios. The two bedroom suites have a master bedroom with Jacuzzi style tub in a quaint loft. All suites have a Caribbean feel and energy, with pastel tiles and light wood furnishings accented by upbeat tropical prints on bed linen and curtains. Satellite television, individual climate control, spacious closets, telephones and equipped kitchenettes will be found in all suites. 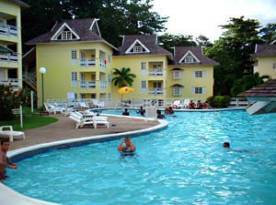 A Colonial style complex, conveniently located in Ocho Rios yet still enjoys a secluded Beachfront location within walking distance to restaurants, nightlife and shopping facilities. 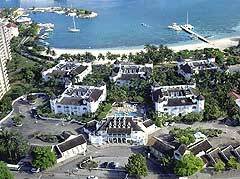 Surrounded by lush tropical gardens, the resort is located five minutes from Turtle Beach and 104 kilometres (65 miles) from Montego Bay Airport.  Sports and leisure - water sports, scuba diving, golf, pool volleyball, dart competition, domino tournament, reggae dance class, bingo. Located on the beach in Ocho Rios, Rooms On The Beach Hotel provides an Internet café and sundries shop in the lobby in addition to an outdoor swimming pool and fitness equipment. 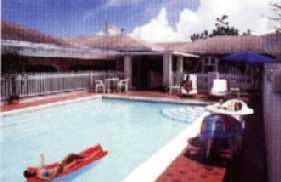 Guests can relax by the pool or work out during their down time. Complimentary continental breakfast is offered every morning in the hotel's restaurant which also offers a full lunch and dinner. 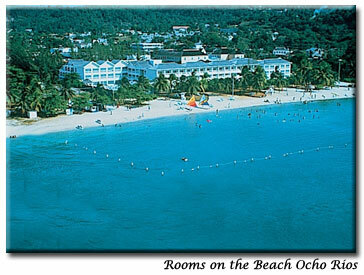 The Rooms On The Beach Hotel has 68 guest rooms and 25 suites, all of which include two double beds and an ocean view. Guest rooms are furnished with the guest's comfort in mind. Amenities include, cable televisions, CD players, coffee makers, hair dryers, and iron and ironing boards. 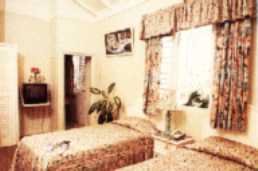 A host of fine services will ensure that their stay is most enjoyable. PLEASE NOTE: Families or guests with children under 7 years are advised not to book the Oceanview Room with Balcony.